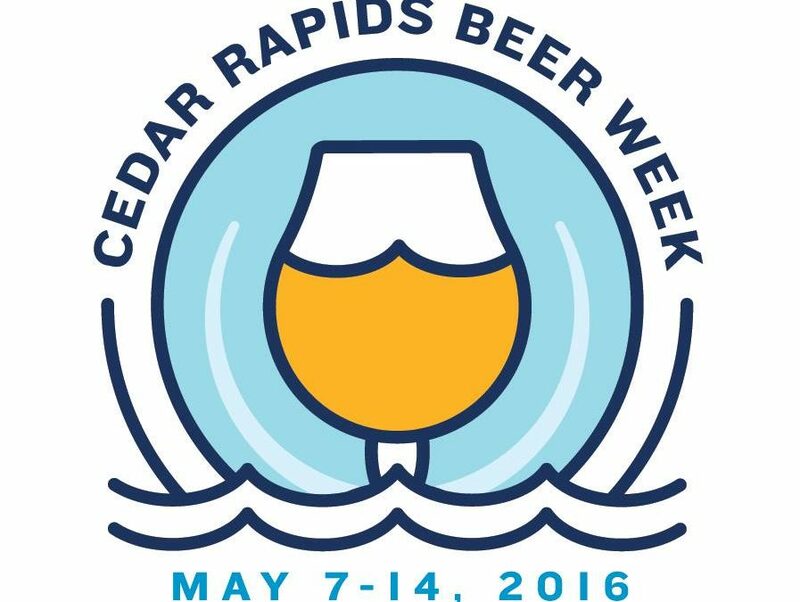 Good afternoon from a rain-soaked Downtown Cedar Rapids, and welcome to the midst of Cedar Rapids Beer Week! This is the second annual week long celebration of beer here in town and the execution of events by the different breweries, bars, and retailers has already been miles ahead of last years beer week. Late whispers of thunderstorms on Saturday turned out to be nothing and the weather for Benz Beer Fest was absolutely perfect. This week offers lots of opportunity. Opportunity to meet new people, try new beers, and patronize unfamiliar spots. Take this week as a chance to discover new things, or open friends up to a new world; a beginning on their beer journey. Close your eyes for a minute and think about where your own personal beer journey started. Maybe it was at a beer festival, where you finally found an IPA that you could palate. Or maybe it was at a tailgate, where you drank a Fat Tire or a Blue Moon that a friend offered you instead of your go-to light American lager. For me it was going to school and living in Kansas City and embracing the culture that Boulevard provides to that city. It was the first sip of a New Belgium 1554 that one of my friends handed me when we were out; followed by the realization and amazement of how much flavor and complexity could be in a beer. And it was the discoveries made through the pick-six area at the local Hy-Vee; all of the labels and bottle shapes were so foreign to me as were the styles of beer inside. My own naivety was the best attribute at the time. I had no experience, no expectations, absolutely nothing to predetermine what I thought of the beer other than the label artwork. Dare I say that beer was fun? And that brings me to what I believe to be the most important part of Cedar Rapids Beer Week: to have fun. One can look around constantly at the different forums, Facebook groups, and meet-ups of people claiming to be advocates of beer and see something completely different. A world in which a premium is placed on ‘new’ and ‘rare’ with buyers becoming collectors and traders. Its a constant competition of sorts that drains some of the fun from the overall experience. Great beers that are readily available lose their luster to these groups. They clamor for new distribution into the state of certain breweries only to burn through their desire in a couple of weeks upon its arrival, shifting their focus once more to talking about what brewery may be on the horizon. And perhaps worst of all, they judge someone else’s beer selection, looking down their nose at them without knowing any other identifying factors about the person. But I believe this to be the minority in an otherwise amazing community. So I offer up a challenge to these people. Retrace the steps of your beer journey and do so with a friend that hasn’t taken that step yet. Rediscover it as they discover it for the first time. Take pride and joy in seeing their own new experiences instead of in the rare bottle that you just scored to keep in your basement for a perfect moment that may never come. Put someone around the wonderful community that I know this to be. The dividends paid will be far greater than any that come from even the rarest bottle. Although Exile Brewing Company was built on the idea of providing well made traditional German styles, they have absolutely taken off with the Bohemian series. Blessed with perfect timing, Beatnik Sour hit the shelves as the national craze over sour styles broke loose. Cherry Bohemian was the first in the series and it created such waves in the local beer community that it demanded more. We’ve gone through raspberry, more cherry, and now as the weather warms we’ve got blood orange. 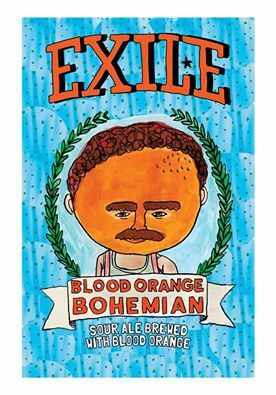 Another great play by Exile as beers using blood oranges have also exploded in popularity over the last year or so. This beer really does not disappoint one bit. From the aroma to the finish it doesn’t overpower with blood orange but gives just enough to complement the acidity already present. Tart on the tongue with a dry finish that transitions into a clementine-like sweetness, Blood Orange Bohemian has catapulted itself to my favorite of the Bohemian series thus far. We still have a bit left here at Bricks so make sure to get some before it’s gone! 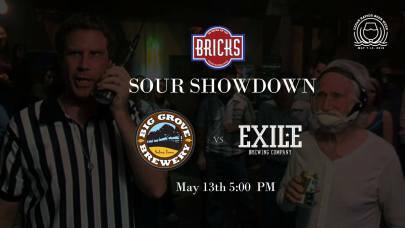 As a perfect transition, we will be featuring Exile and Big Grove this Friday, May 13th and some of their sour beers including a pin from each brewery. We’ve dubbed it the “Sour Showdown” and it surely will not disappoint. We’ve already got Blood Orange Bohemian and Mofo Beatnik (wine barrel-aged Beatnik) from Exile, and Que Sera will be making a long overdue return to the tap lineup. As far as pins go, well, I don’t want to say too much but some of the ingredients include pomegranate, blackberry, and mint. We’ll be kicking everything off around 5 pm so cut out of work half an hour early and get yourself downtown for a funky Friday the 13th. I talked a lot earlier about personal journey, specifically in the beer world. We find ourselves discovering new styles with heightening levels of intensity and flavor until we look back and don’t even recognize the beer drinker that we used to be. Similar are our other journeys in life. Years worth of experiences mold and shape us as we grow up and we look back at photographs from years before, different yet the same. And as we age, we expect to have it all figured out at some point; except that we never quite do. This idea is perfectly laid out in the song Pretty Pimpin’ by Kurt Vile. A deliberate downbeat with sharp finger-picked guitar overlays that are made to sound easy kick off this laid back track building into a full band effort. The song itself outlines the struggle of bringing himself back to reality, while figuring out exactly who he’s supposed to be or what he’s supposed to be doing. Wavering between comfortable and confused, Vile’s lyrics seem effortless just like every other bit of his style. It just so happens that there’s a perfect beer to fit this scenario: Beerito by Oskar Blues. Beerito is a Mexican Lager, on the surface seemingly boring to a hop-head in search of the freshest IPA. It’s a snapshot however of coming somewhat full circle in the journey; going back to an easy drinking lager with a great malt profile that adds a nice rounded flavor. Hopefully you’ll be more content than confused and remember how great and refreshing lagers can be especially this time of year. Beerito is fresh on tap and I gotta say, its pretty pimpin’.